Mallory Bowers is a 5th year Neuroscience doctoral candidate working with Dr. Kerry Ressler at Emory University. Prior to graduate school, Mallory received her Bachelor of Arts from the University of Pennsylvania. Mallory is interested in behavioral neuroscience, with a particular focus on how neural plasticity contributes to learning. Furthermore, she is interested in how aberrant neural plasticity can instantiate psychiatric disease. With Dr. Ressler, Mallory is using a mouse model of exposure-based psychotherapy to better understand the neurobiology of learned fear. Specifically, her research focuses on a putative interaction between the cholecystokinin and endogenous cannabinoid systems that may underlie the extinction of cued fear. A list of her publications can be found here. Outside of the laboratory, Mallory is very interested in issues at the intersection of gender and neuroscience. Mallory is particularly interested in how biological differences are used to ascribe gender differences. Research of late has focused on the role of estrogen in mediating differential rates of psychiatric diseases between the sexes. Mallory is interested in researching the relative contributions of biological factors versus social conditioning as it relates to the etiology of psychiatric disease in women. 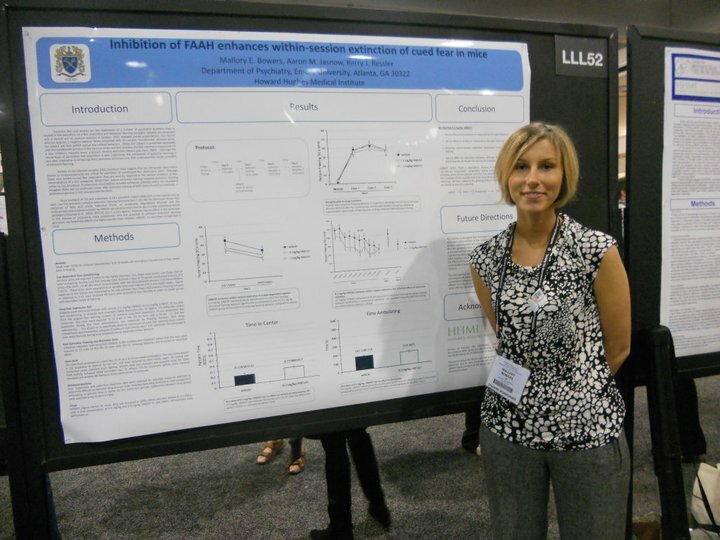 Mallory is also the current president of Emory Women in Neuroscience (E-WIN). Under Mallory’s leadership, E-WIN has provided a forum for women in the neurosciences at Emory. E-WIN seminars have featured faculty from Emory and outside institutions and fostered discussions on professional development, employment negotiations, sexism within science, and work-life balance. Mallory also took an active role in organizing this year’s annual neuroethics symposium at Emory, “Bias in the Academy: From Neural Networks to Social Networks”. She looks forward to engaging more in the NEW Leaders community! Mallory will be attending the NeuroGenderings III Conference in Lausanne this May 2014. If you plan on attending, please get in touch with her! Her Twitter handle is @mallorybowers. This entry was posted on January 6, 2014, 12:42 pm and is filed under meet a member. You can follow any responses to this entry through RSS 2.0. You can leave a response, or trackback from your own site.